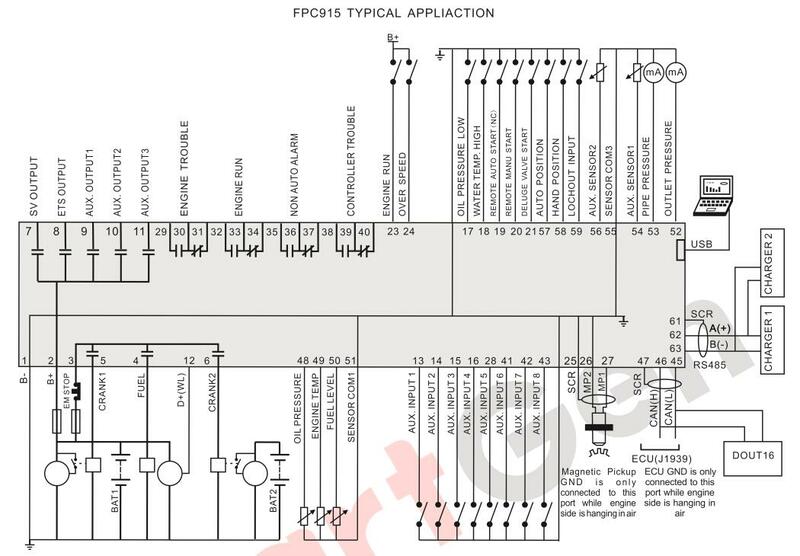 FPC915 Diesel Driven Fire Pump Controller is designed for fire pump systems which controlled by engine. It allows automatic start/stop, data measurement, alarm protection functions. CANBUS (SAE J1939) interface enables the controller to communicate with various engine which fitted with J1939 interface. FPC915 Diesel Driven Fire Pump Controller fit with LCD display, optional languages interface (including English, Chinese or other languages); simultaneously the exact parameters of pump unit and engine are indicated by the LCD display on the front panel and the controller is reliable and easy to use. adopt powerful 32-bit ARM microprocessor technology with precision parameters measuring, fixed value adjustment, time setting and set value adjusting and etc. The majority of parameters can be configured from front panel and all the parameters can be set using PC (via USB port). It can be widely used in a number of pump control systems with compact structure, simple connections and high reliability. 480x272 pixel, 4.3 inches coloured TFT-LCD with backlight, multilingual interface (including English, Chinese or other languages) which can be chosen at the site, making commissioning convenient for factory personnel. Improved LCD wear-resistance and scratch resistance due to hard screen acrylic. Silicon panel and pushbuttons for better operation in high/low temperature environment. RS485 communication port enabling remote control, remote measuring, remote communication via ModBus protocol. Equipped with CANBUS port and can communicate with J1939 genset. Not only can you monitoring frequently-used data (such as water temperature, oil pressure, engine speed, fuel consumption and so on) of ECU machine, but also control start, stop, simultaneously expand module viaCANBUS port. Discharge pressure curve and flow curve are user-defined. Multiple analog sensors; sensors can switch between resistor type and current type using jumper. More kinds of curves of temperature, oil pressure, fuel level can be used directly and users can define the sensor curves by themselves. Precision measure and display parameters about Engine and pump unit; e.g. engine high water temperature, low oil pressure, over speed, high water pressure, low water pressure, over flow and other kinds of fault indication and protection function. Parameter setting: parameters can be modified and stored in internal FLASH memory and cannot be lost even in case of power outage; most of them can be adjusted using front panel of the controller and all of them can be modified using PC via USB port. Accumulative total run time A and B. Users can reset it as 0 and re-accumulative the value which make convenience to users to count the total value as their wish. Can control engine heater, cooler and fuel pump. Modular design, anti-flaming ABS plastic enclosure, pluggable connection terminals and embedded installation way; compact structure with easy mounting.